A lottery launched this week for 113 mixed-income apartments in Edgemere, a beach-front neighborhood just outside of Far Rockaway in Queens. Designed by Curtis + Ginsburg, the eight-story building meets passive house certification by utilizing a geo-thermal cooling and heating system with a resilient, flood-proof design. 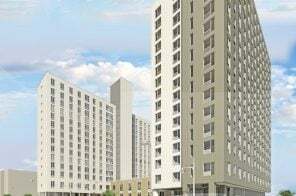 Qualifying New Yorkers earning 30, 40, 50, 60 and 100 percent of the area median income can apply for the available units at 45-19 Rockaway Beach Boulevard, which range from a $331/month studio to a $1,910/month three-bedroom. 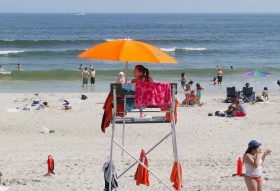 Just days before New York City beaches were scheduled to open for the season, officials announced this week that a half-mile stretch of popular Rockaway beach will be closed this summer. The shuttered area spans roughly 11 blocks between Beach 91st and Beach 102nd Streets, considered by some to be the center of the beach. The city closed the section of the beach, previously set to open Saturday, because of safety issues from erosion, the New York Times reported. That particular area of the beach may be closed for many years because there “just isn’t enough space to operate the beach” according to Liam Kavanagh, the first deputy commissioner for the city’s parks department. 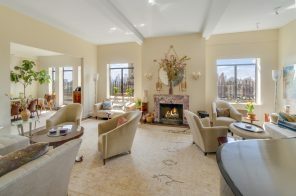 Looking for beachfront living that’s only a train ride away from Manhattan? Here’s your answer. 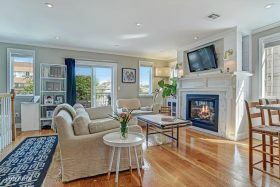 This three-bedroom condo has hit the market in the Far Rockaways, at 124-11 Rockaway Beach Boulevard. It’s got all the right beachy interior details: open floorplan, big windows, two outdoor spaces, private parking, and a washer/dryer unit to clean your swimsuits and towels. Because, of course, the location is just a mere block from the Rockaway boardwalk and beachfront. After selling in 2015 for $492,000, it’s now asking a hair under $600,000. 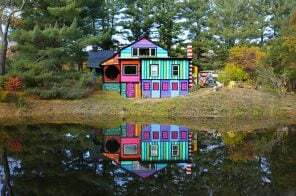 Set sail for home in Jamaica Bay on this $59,000 houseboat, now for sale. According to its listing, the 400-square-foot model is good for year-round living and is equipped with central cooling, carpeted floors and wonderful waterfront views. 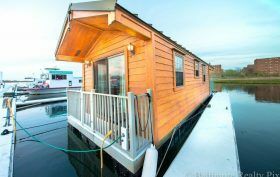 Plus this “single family” vehicle has one bed, one bath, a very large covered deck and “great solar potential”—not to mention you’ve got the ocean as your playground. The listing says the houseboat, a 2007 Custom Flo-Lodge, was hauled a year ago across the Verrazano Narrows to its current docking point at Far Rockaway’s Marina 59, and has been floating there ever since. 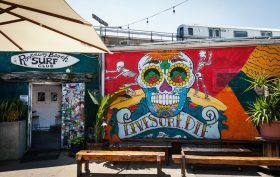 Rockaway Beach is having a rebirth of sorts as more and more New Yorkers head for its waters on the hottest of days. On top of new restaurants, coffee shops, art galleries, surf clubs and other hipster hotspots popping up along its main drags, now comes an opportunity to live in a brand-new construction at 9306 Shore Front Parkway, just steps from the sand. Per the NYC Housing Connect, households of up to six earning 40, 50 or 150 percent of the area median income can now apply for 63 studio, one-, two- and three-bedroom apartments priced between $494 and $2120. Those who laughed at Kent Johnson’s plan to bring a “glamping” site to the Far Rockaway can now eat a slice of humble pie. 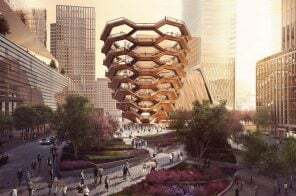 It looks like the designer has raised enough funds via Kickstarter to make the “luxurious” campsite a reality. Johnson targeted $50,000, and just a mere five hours ago managed to exceed his goal by $789. 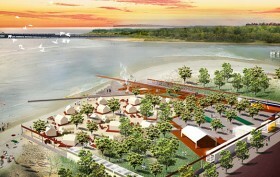 Say goodbye to the old wooden bungalows, and hello to a new, much more sustainable community. Ever since Hurricane Sandy devastated Far Rockaway, there have been plans to either rebuild it magnificently or leave it alone. 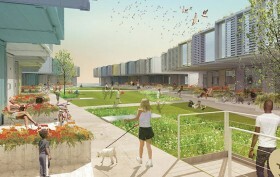 The new design from LOT-EK (famous for their shipping container houses) makes it a beautiful community to rival to those in Manhattan. Aptly dubbed DUNE CO-HABITAT, the 80+ acre plan involves building a community of houses on raised platforms, and using planted dunes as a natural flood defense.